The first process that the fission neutrons of one neutron generation may undergo is the fast fission. The process of fast fission occur at higher than thermal energies, in fact mainly at energies higher than 1 MeV. The fast fission occurs mainly in 238U, but also in other fissile isotopes (235U and 239Pu). The fission cross-section of 238U is similar to the other fissile isotopes, they are relatively low (of the order of barns). But there is significantly larger amount of the 238U isotope in the reactor core (in thermal reactors low-enriched uranium of about 5% is usually used). It is obvious the fast fission factor is strongly influenced by the arrangement and concentrations of the fuel and the neutron moderator, because the core geometry determines the neutron flux spectrum. In a homogenous reactor core, where fuel nuclei are surrounded by many of moderator nuclei, there is a very high probability, that the first collision of a fast neutron will be with a moderator nucleus resulting in the significant loss of its initial kinetic energy. Therefore in homogenous reactor cores, the fast fission factor is essentially 1.00. On the other hand, in a heterogeneous reactor core, all the fuel nuclei are in fuel pellets that are encapsulated within a fuel rod. 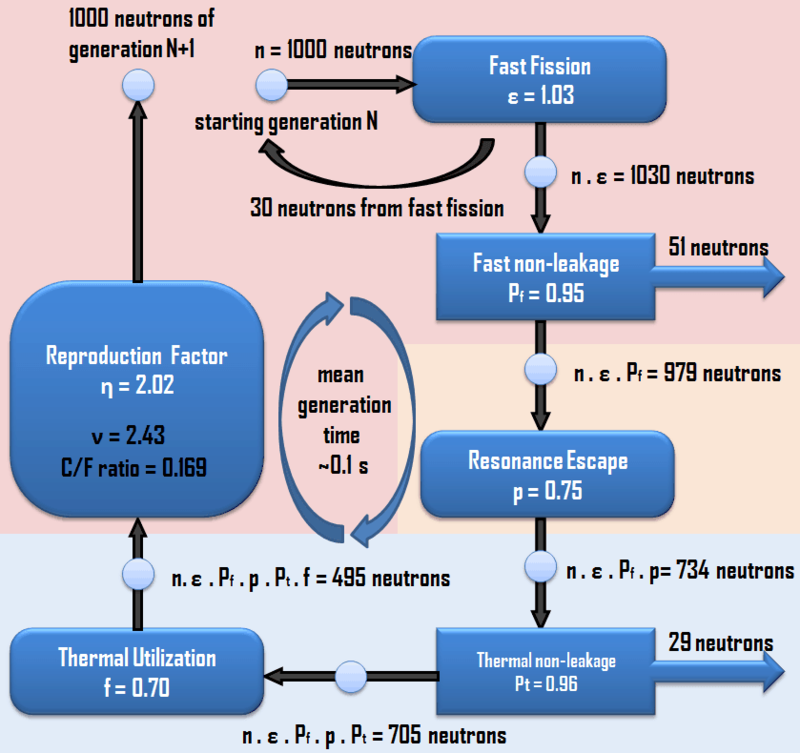 This arrangement increases the probability, that the first collision of a fast neutron will be with a fuel nucleus. Therefore in heterogeneous reactor cores, the fast fission factor is essentially higher than one, let say ~1.03 and this value is minimally affected (in comparison with the other factors) by operational changes such as the change in the moderator temperature or fuel burnup.